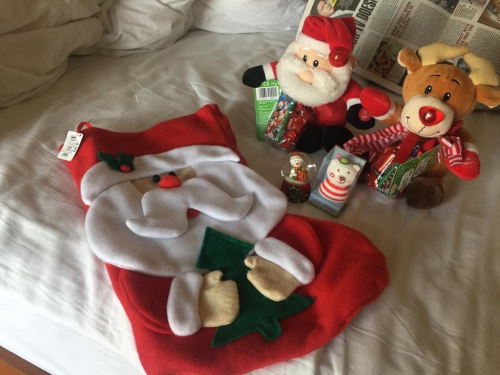 Raymond walked into his bedroom with a fresh cup of coffee for a relaxing Sunday morning and found the Christmas decorations laid out on the bed next to his newspaper. “You never give up, do you, Mom?” Setting his cup down on the end table, the 45-year-old divorced engineer sat at the foot of the bed and picked up the dollar store Santa. “I miss you too, Mom, especially this time of year.” He knew his ex had her place elaborately decorated for the season, and that his three sons delighted in trying to guess what was inside all of the brightly wrapped packages, but he’d given up on Christmas and everything it was supposed to stand for when his Mom died a month after his divorce was final. Taking a deep breath, he picked up his cell and punched in a number. “Hi, Sherry. Is it okay if I come over for a while? I’ve got some presents for the boys.” He listened and smiled. Of course, he’d have to go shopping first. I wrote this for the 196th FFfAW Challenge hosted by Priceless Joy. The idea is to use the image above as a prompt for crafting a piece of flash fiction between 100 and 175 words long. My word count is 174. This is pretty much a “stream of consciousness” thing. I just wrote the first thing that popped into my head. The Christmas after my mother passed I was sitting in the bed room of my apartment I caught a whiff of a familiar perfume: Charlie. One of Mom’s favorites. Some of the furniture sitting in my room had been in her room for a couple of years, so it is possible that what I smelled was nothing more than lingering fragrance, but how do you explain that the air currents from the vents were going away from my bed? I still think Mom stopped in to check on me. I certainly believe it’s possible. It is the time of year for families to make an effort to be together. Feelgood story James. There’s a sad angle to this story, one that many will relate to. Yes, there’s a lot of loss, which can hit folks pretty hard this time of year, but at least Raymond was able to salvage what he had left. A sweet little Christmas tale. Nice story. Who had left the dollar store Santa on his bed? At least he is buying presents for his children, despite his state of mind. I’ve suggested that the ghost of his departed Mom supernaturally left Christmas items on his bed. Festivals are fun only when you have your dear ones around, even a small meal feels like a treat with family. Very touching story, James! Even if he doesn’t have the Christmas spirit he is going to make sure his boys get gifts.